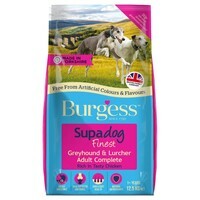 Burgess Supadog Finest Greyhound and Lurcher Adult Complete Dog Food (Chicken) is a nutritionally complete diet, designed specifically for the needs of the breeds unique physiology. Formulated with a lower level of protein to help avoid anxiety and hyperactivity, the food also contains glucosamine to help stiff joints and Omega 3 to help temperature regulation. My whippets love this food. Have used for years and will continue to use it. Again well done Vetuk for good prices and offers. Belle and Manny have been on Burgess (Supadog) Greyhound and Lurcher Chicken for 2 years doing great and scoffed by foster greyhound Freddie. This food is a favourite with my 2 rescue greyhounds. I was looking for something that stopped flatulence and resulted in solid stools and say good reviews about this so tried it for myself. It is absolutely brilliant and does just that. It tastes good too ( yes I have tried it). Only wish it came in 15kg bags. My worker and pet lurchers love this food, moistened with a little warm water, and some of them are fussy eaters!